Many people who live in a world of make-believe and others who are just uninformed, plus many others who have vested interests in maintaining an illusion, have long subscribed to the idea that in the European Union all countries are equal. More than that, they are all best friends. Some even defended that nation-states were fading away and soon would be nothing but unpleasant memories. 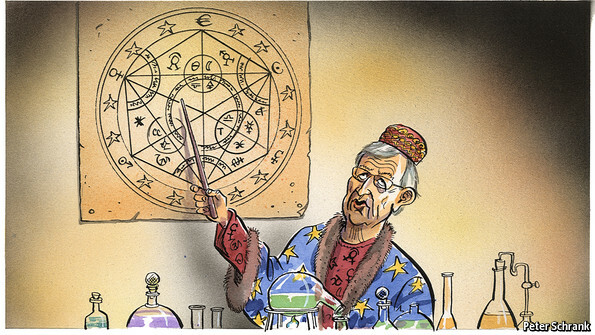 No alchemy, just a poor Luxembourger commissioner adrift. So, one can only imagine the shock the first group must have felt when Jean-Claude Juncker, the archetype of Euro-federalist-Brussels insider-EU fundamentalist, declared that France will NOT be punished for exceeding the 3% budget deficit ceiling, because…. It is France: The European Commission has given France leeway on fiscal rules "because it is France," the president of the EU executive Jean-Claude Juncker said (…). (In “REUTERS” at http://uk.reuters.com/article/uk-eu-deficit-france-idUKKCN0YM1N0 ) Serves them right. Not that it is something that new or surprising. If one follows History, International Relations and Geopolitics, one will know that countries are NOT equal and they are frequently NOT friends and very seldom so for life. Actually, the Portuguese may remember that in 2002 the EU opened an excessive deficit procedure against Portugal and when the fine looked inevitable, the process was dismissed, because….it turned out that France and Germany has incurred in the same violation and of course they could NOT be punished. No, Brussels would NEVER do that. NOT then, NOT now and NOT ever. And the Danish may remember to have voted “NO” to the Maastricht Treaty and finding out that quite a few people, including foreign politicians and opinion makers were advocating Denmark’s exclusion from the European Community. However, when France (and The Netherlands) blocked the Constitutional Treaty in their referenda, no one pointed the exit to Paris and Amsterdam. No, they just froze the Treaty. So, let us all shred the fanciful talk about equality and friendliness. The EU is about power and influence: those who have, use it; those who do not, suffer the consequences. They may have scrapped the tanks, the bombers and the cruisers, but when the major powers want to have their way, they can and they do inflict pain. Just ask the Greeks. Or ask the Portuguese, for that matter.